Square Enix is offering Kingdom Hearts III pre-order incentives by way of in-game keyblades based on the storefront you choose. Each keyblade has a slightly different design and enhances different elemental attributes and bestows a ‘-gun’ level magic of that same element. To break it down further, the Amazon keyblade ‘Dusk Till Dawn’ will bestow the ‘Firagun’ magic and enhance fire-elemental damage. The PlayStation Store keyblade ‘Midnight Blue’ will get you ‘Blizzagun’ and ice-elemental damage up; the Xbox Games Store keyblade ‘Phantom Green’ will get you ‘Thundagun’ and thunder-elemental damage up. Also, if you’re hunting down keyblades before Kingdom Hearts III launches on January 29th — note that you can also nab the ‘Starlight’ keyblade from Kingdom Hearts Union χ [Cross] by attaining a certain score in the Classic Kingdom minigames. Kingdom Hearts III releases on January 29th for PlayStation 4 and Xbox One. Why. Why, Square Enix?! 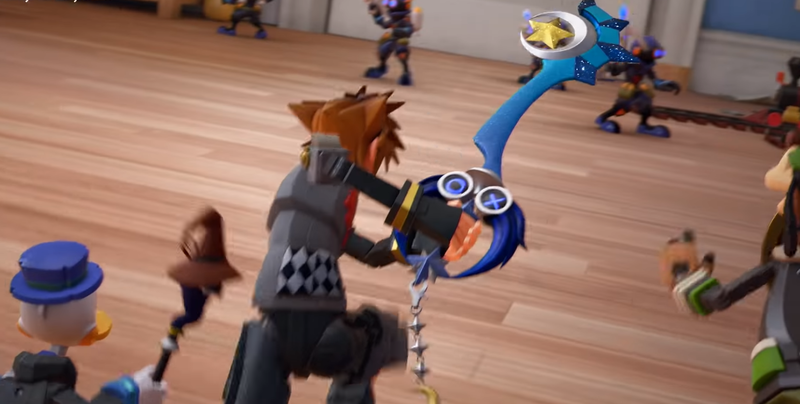 Why did you make three separate exclusive pre-order DLC Keyblades?! For those who are completionists/collectors, they’re going to have to order two separate editions just to get 2 of the 3 Keyblades and still won’t be able to get one, depending on what platform they play on. This crap pisses me off so much! the weapons are probably crap though, just look at FFXV’s “exclusive pre-order” weapons lol not only that, eventually, they were all released as paid DLC which I assume will be the case for this as well so you’ll most likely get them all anyways, just not right off the hop. This is coming from a fellow collector lol these “pre-order” dlc’s ALWAYS eventually get released to everyone, in every game. The whole point of it being timed to pre-orders is so people buy. I had heard that in other games where Square has done this, it didn’t necessarily happen. For example, in Final Fantasy XIII Lightning Returns, the PC version still never got the Cloud costume DLC. I guess we’ll have to wait and see, but it’s still a pretty dirty practice.